Gate Sentry is the most technologically advanced visitor management solution available on the market. It dramatically enhances security by linking residents and end-users directly to the security team via cutting-edge cloud-code technology. Gate Sentry is a completely mobile visitor management system, revolutionizing visitor access for guarded properties. Featuring mobile apps for residents and security staff, Gate Sentry syncs in real-time to provide accurate visitor management without the expense of added hardware or software. This solution eliminates outdated paper logs, expensive hardware, software and printing required by other visitor management systems and allows residents to manage their guest list from anywhere in the world. 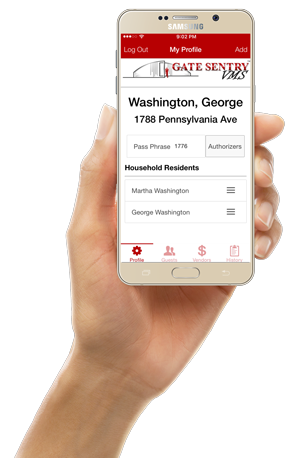 Gate Sentry mobile app can be easily downloaded directly to the resident’s iPhone, iPad, or Android smartphone or tablet. The app allows residents to manage their personal profile and easily control and remotely modify their guest list from anywhere in the world. Residents can now manage their own visitor list in real-time, ensuring a more secure property, accurate guest access and reduced wait times for visitors. 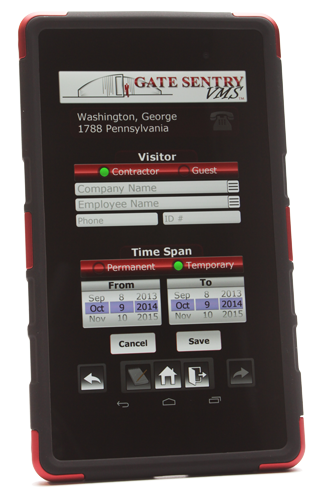 Security Staff mobile tablet is continually updated with resident changes eliminating phone calls, handwritten logs and outdated visitor data. Without leaving a visitor Security can verify guest identity, grant access and send a mobile notification to the resident. Instant data storage for Total Recall Reporting™. WHY DO WE NEED A VISITOR MANAGEMENT SYSTEM? A visitor management system allows a security team to quickly, efficiently and cost effectively process visitors into a guarded property. The security company is equipped to closely manage and track visitor access into the property. However, most security companies still rely heavily on paper-based visitor data, clipboards, or paper logs to verify and document access into the community. These paper-based logs are often outdated and inaccurate because it takes time for the security team or property manager to contact each member of the community for visitor updates. Typically this role falls to the property manager, who is already managing a full workload of managing the property. Property owners typically have no access to their own visitor information so they can't easily update the visitor list. Most importantly, there is no effective way to track or report on historical access data because much of the data is stored on often illegible paper logs. Gate Sentry is the next generation in visitor management technology because it links property owners directly to their security team via cloud-based mobile applications. This not only eliminates outdated paper logs but also the need for expensive hardware, software, and printing required by other visitor management systems. Gate Sentry significantly improves overall security because it provides the most accurate visitor information in a mobile format. Most other systems are computer or web based and require both the residents and security guards to log on to a computer terminal to edit/view visitor data. These systems fail to be completely effective because of the slow processing time at the security entrance and the low resident adoption of logging into the computer. Residents revert to calling the security office or the property manager with visitor updates, thus losing control over their own data. Since Gate Sentry is based on smart phone mobile technology, property owners adopt the system quickly and can access and manage their own guest list in real-time from anywhere in the world, providing the security staff with the most up-to-date and accurate visitor information available. DOES OUR HOA NEED TO PRINT VISITOR PASSES? No. Gate Sentry eliminates the need for excessive expenses related to hardware, software and printing. Printing visitor passes are an added expense that may not provide added security since the passes can often be passed on to others who have not been properly authenticated by your security team. Printing passes or badges with copies of a visitor’s ID helps to alleviate this concern, but the hardware, ink, and paper is an unnecessary cost to your community. By storing the authorized visitor’s ID on the Gate Sentry security application, your security team can verify the visitor’s identity as easily and more securely with Gate Sentry than with a printed day pass. WHAT IF SOME OF OUR OWNERS DON’T HAVE A SMART PHONE? 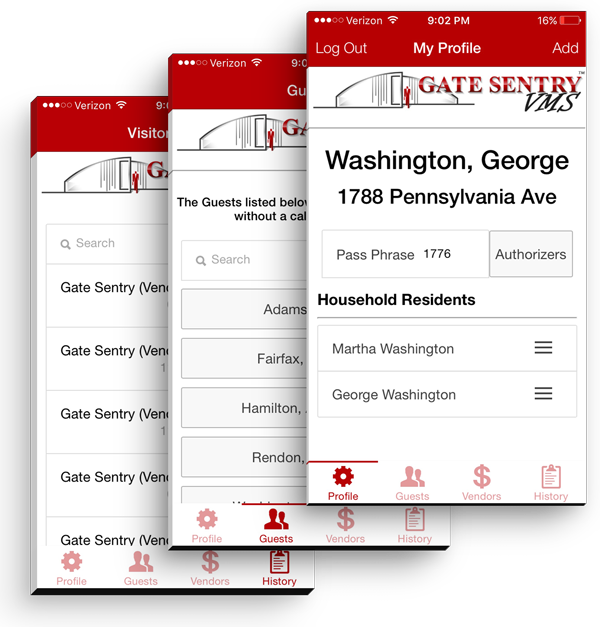 The easiest way to access visitor data is by using the Gate Sentry smart phone mobile app; however, visitor data can also be accessed via a web portal. Owners that don’t use either a smart phone or the web can call security or the property manager to update their visitor information. The security mobile app also allows security to add/edit visitors if requested by the owners. WHAT IF OWNERS STILL WANT A CALL FROM SECURITY FOR VISITOR ARRIVALS? Many owners enjoy the “advanced warning” of an incoming guest. This is one of the benefits of Gate Sentry’s arrival notifications, which are automatically sent by the system via the owner’s mobile app and/or email for all visitors granted access to the property. If a visitor is not listed on the owner’s visitor list, security is still required to call for authorization. WHAT IF A VENDOR IS GOING TO MULTIPLE RESIDENCES? For vendor access, Gate Sentry allows the security team to select multiple homes that vendor is visiting on the same visit. Gate Sentry will then automatically notify all of the owners selected by the security staff. DOES GATE SENTRY IMPROVE VISITOR PROCESSING TIME AT THE PROPERTY ENTRANCE? Yes, because the security app is mobile, we train security to verify the visitor’s identity without leaving the visitor’s side/vehicle. 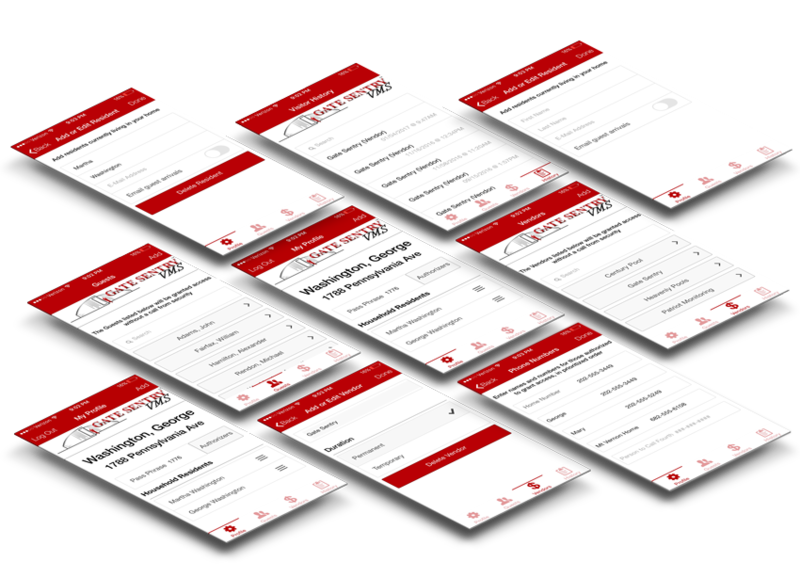 If previously authorized, all visitor information required for granting access is available on the Gate Sentry mobile application and visitor processing can be as quick as 20 seconds. This not only speeds visitor processing but also improves the professionalism of your security team. CAN SECURITY APPLICATION BE USED BY ROVING GUARDS? Yes, the Gate Sentry security application can be used throughout your property and works off-line but will automatically synchronize the latest information when in range of an authorized Wi-Fi signal. Gate Sentry can be used to verify visitors in any portion of your community (pools, parks, tennis courts, beaches, etc.). HOW DOES THE SECURITY TEAM USE GATE SENTRY TO VERIFY A VISITOR? Each visitor’s profile provides information on their permanent or temporary visitor status. If temporary, a date range of authorized visiting time is shown. In addition, the profile allows for security to scan the visitor’s ID upon first arrival in order to verify identity on subsequent visits. CAN PROPERTY OWNERS SEE WHO WAS GRANTED ACCESS TO THEIR PROPERTY? Yes, in addition to receiving a notification of a visitor’s arrival, both the owner’s mobile application and the web portal provide historical access information with the date and time of day they were granted access. This is especially helpful for owners who are away from their property for weeks or months at a time but still need to know that their vendors are managing the property or that their renters are arriving as scheduled. ARE THERE ANY TRACKING OR REPORTING CAPABILITIES FOR THE COMMUNITY AS A WHOLE? The Gate Sentry administrator for your community can run historical access reports for the entire community, for specific days, or for a specific owner. Historical access tracking and reporting using Gate Sentry allows for better data security over traditional paper logs since the data is not stored in paper format. All data is stored and accessible electronically. IS MY COMMUNITY AND VISITOR DATA SECURED? Gate Sentry data is stored on secured encrypted servers using data server redundancy to avoid loss of information. Gate Sentry also uses encrypted data transfer protocols to ensure complete data security between the database and the users. DOES GATE SENTRY PROVIDE TRAINING? Yes, we provide your security staff, community administrator and/or property manager with the training needed to properly use Gate Sentry. The training for the security team focuses on the proper use of Gate Sentry to improve visitor processing time and accurate tracking information. This includes training on how to request the right amount of information from incoming vendors in order to notify all owners being visited to improve efficiency and professionalism. HOW SOON CAN I HAVE GATE SENTRY RUNNING AT MY COMMUNITY OR CONDO? The typical process includes introductory communications; owner database development; security/administrator training; and system roll-out. The process takes 30 days or less.